We have what you need to clean! You can now purchase some products we sell in our store on this website. Go to Shop and browse through what we have listed. We are adding new products all the time! 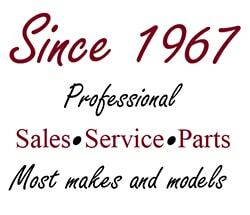 Since 1967 we have provided professional vacuum cleaner repair, sales & service, sewing machine repair, sales & service, IQAir air purifier sales, Mettler thread, commercial vacuum cleaners for residential and building maintenance, extractors and encapsulation carpet cleaners, commercial cleaning supplies, chemicals and floor coatings for business and residential maintenance. We specialize in what we do and are careful to match products to each individual customer. We enjoy helping people and are here to help! We offer 6-month to 1-year no-interest financing OAC for your convenience. If you are not able to drive to our store, please call for local in-home pickup and delivery. We are most likely near you and are worth the drive if we are not. Learn more about ABC Fullerton Vacuum & Sewing LLC.